The University of Pennsylvania, founded by none other than Benjamin Franklin, is located in America's birthplace, the city of Philadelphia. The 302-acre campus, set within an urban environment, ensures that Penn students take full advantage of city life. The West Philly neighborhood is called University City, vibrant with restaurants, museums, shops, and theaters. 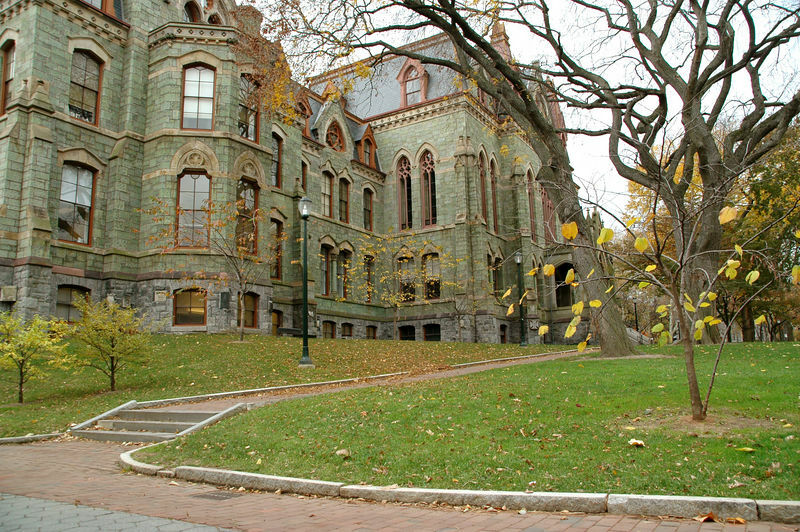 Ivy League Penn is the dominant institution but also shares the area with Drexel University. 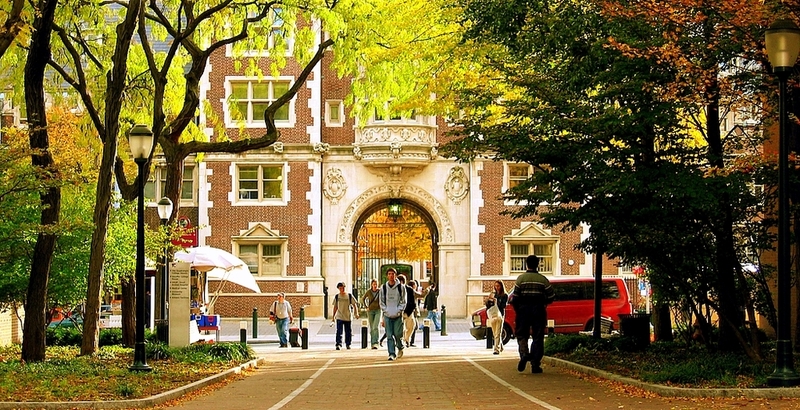 UPenn has a rich history, academic excellence and the friendly, livable city of Philadelphia at its doorstep. Transportation: The Philadelphia International Airport is located in the Southwest section of the city, approximately 20 minutes from the UPenn campus. Amtrak provides intercity rail service to Philadelphia's 30th Street Station. Frequent service is offered to Northeastern cities including Boston, New York, Baltimore, and Washington. Intercity bus service is provided by Greyhound and Trailways bus lines from the terminal at 1001 Filbert Street, and MegaBus and Bolt Bus provide service to 30th Street Station. Stay: For years the Inn at Penn was everyone’s first choice with a enviable location adjacent to the main quad, and is still a top pick for many college families. It’s now facing competition from the year-old The Study, also conveniently located catty-cornered to the entrance of Penn. The Study’s biggest draw is its stylish, book-filled lobby, nicknamed the “living room,” the heart of the hotel with sitting areas, study desks and computers, and an all-day café/restaurant The CO-OP. On a recent stay, we found the rooms minimal but comfortable and the location ideal, though service was spotty at times with room service trays left in the hall all day even after a phone call. Another option near campus is the Sheraton University City. If you prefer to stay downtown, just a ten-minute cab ride from the university, we suggest The Rittenhouse Hotel, AKA Rittenhouse Square, Kimpton Palomar, or fresh off a 25 million dollar renovation the luxurious Ritz-Carlton. Coffee: The most convenient spot before your tour, and perfect for early risers is the Starbucks on the corner of Walnut and 34th, directly across from the main quad. (Weekdays it opens at 5:30 am, 6 am on the weekends.) There is also a Starbucks Café in the Penn bookstore just down the street that opens weekdays at 8:30. If you’re staying at the Study, there is a Saxby’s and Joe’s right across the street. Breakfast: If you fancy sweets for breakfast run don’t walk to Philly’s legendary Federal Donuts with a branch on Sansom Street right down the street from campus. Don’t look at what's in the display case; you need to order a hot fresh donut, a choice of three flavors: Cookies and Cream, Cinnamon Brown Sugar or Strawberry Lavender. After 11 they start serving fried chicken with a selection of dry seasonings or glazes with of course a side of honey donuts—our kind of hook up. One afternoon we tried the fried chicken sandwich done up with buttermilk ranch seasoning, cheese, dill pickle and spicy Rooster Sauce on a Martin's Potato Roll-- addictively good! Anytime Of Day: Franklin’s Table Food Hall is a mecca for hungry students and locals that opened last March right on Walnut across from the main campus with an drool- worthy line up of vendors from established spots across the city. Opening at 7 am weekdays (10 on weekends) start your day with smoothies or acai bowls at The Juice Merchant or the acclaimed Forger sandwich or a BEC at High Street Provisions. Lunchtime savor a falafel sandwich or salad at Goldie’s from Philly’s famous chef Mike Solomonov of Zahav fame washed down with their addictive tehina shakes. With wood-fired pies from Pitruco Pizza, rolls and sashimi from DK Sushi and burgers, cheesesteaks and fried chicken sandwiches at KQ Burgers there is a food stall to satisfy everyone in your family. And be sure to save room for Little Baby’s Ice Cream for dessert, known for its creative flavors. Lunch: White Dog Cafe is a rambling restaurant interspersed between three connecting Victorian brownstones filled to the brim with quirky and adorable dog décor—this is a restaurant with personality! White Dog is extremely popular with locals and students alike for not only its nod to our canine friends but its eclectic farm to table menu. At Metropolitan Café, it’s the soups, salads and their famous grilled cheese that keep students coming back for more. The bakery is also popular at breakfast thanks to artisan bread, granola, cereals, and tarts. Other good choices include modern cantina Distrito from Iron Chef Jose Garces or Baby Blues BBQ Philly. Downtown’s, Reading Terminal Market, is an extravaganza of food; one of America’s largest and oldest public markets with some 80 plus vendors and everything from Asian dishes to Middle Eastern fare to authentic Philly cheese-steaks and Pennsylvania Dutch pancakes. It’s a neon wonderland with something to satisfy everyone in your family. Casual: Right near Penn in University City, head to Han Dynasty for Dan Dan noodles and what is considered some of the best Chinese food in Philly. Heading downtown? In Rittenhouse Square, American bistro Rouge’s hamburgers are some of the best in the city, filled with Gruyere cheese topped with caramelized onions. Also overlooking Rittenhouse Square, Stephen Starr’s Parc is a modern Parisian style bistro, a nice choice also for breakfast or lunch. On a recent visit, we ventured slightly further afield (15 minutes or so) to the hipster Fishtown neighborhood where we had an fantastic meal at Middle Eastern Suraya. We also enjoyed brisket ramen with matzo balls at Asian fusion, Cheu Fishtown, a genius combination. A Step Up: Consider yourself lucky if you can score a reservation at what many consider to be Philly’s best restaurant, Zahav, from Chef Michael Solomonov. His unique take on Middle Eastern cuisine has garnered him high praise and legions of fans. Any restaurateur or chef couldn’t hope for better reviews or more accolades than the one’s Vernick Food & Drink has accrued in the last few years. Located in a brownstone right off Rittenhouse Square the menu reads comfort food with a chef’s twist; every dish we had was top notch and the service was stellar. One of Food and Wine’s best new chefs, Eli Kulp’s High Street on Market is another favorite Philly spot. Tired after a long day and looking for something convenient, right in University City, dine at Restaurateur Stephen Starr's stylish Asian fusion Pod set in a funky, modern room--sit in either one of the pods that change colors or at the conveyor sushi bar. Late Night Snack: Students frequent Insomnia Cookies on Spruce Street, and Ben and Jerry’s on South 40th. Local Attractions: On campus and affiliated with the university allow some time to stop by the Institute of Contemporary Art, known as the ICA, to see their latest exhibit. If you haven't visited the Liberty Bell since an elementary school trip, it may be time for a repeat visit, but we’d suggest the nearby National Constitution Center instead; an engaging, interactive and surprisingly stirring museum devoted to the U.S. Constitution or the year-old Museum of the American Revolution. If you’re a fan of Renoir, Cezanne, and Matisse a visit to the Barnes Foundation is a must, home to one of the best collections of French Impressionists in the world. The Philadelphia Museum of Art is another worthy art stop boasting an impressive array of American, European and Asian art. For something a little different, though not for the faint of heart visit the Mutter Museum, showcasing medical oddities and home to the remains of Einstein’s brain. Just toured the UPenn Campus? Are you a UPenn student, parent or Alumni? Fill out this 2 minute survey to supplement our Daytripper University Guide for UPenn!